The U.S. Men’s National Team is through to the quarterfinals at the 2014 IIHF Men’s World Championship after finishing the preliminary round with a better-than-expected 4-1-0-2 record. The U.S. closed out preliminary-round play Tuesday with a 5-4 win over Germany. They now await the result of Russia-Belarus to finalize the seeding. Assuming Russia beats Belarus in any fashion, Team USA is locked into second in Group B. That win today over Germany was a close shave for the U.S., but it featured some of the very best goals I’ve ever seen scored at this tournament and some of the best I’ve ever seen period. Watch both after the jump, plus a bonus assist that will make your head spin. Now I’ve been watching Drew Shore play hockey since he was 17 at the NTDP. I knew he handled the puck well. I’ve never seen him do anything like that. Would that work against NHL defensemen? I mean, maybe. Probably not most, but this was about as flawlessly executed as I’ve seen this move. Plus Shore had the awareness that the goalie was going for the poke and slipped it through. The quick hands at the end of the sweeping-between-the-legs move? Mercy. If you’re looking at this still image below, how many of you would think, without knowing anything about Gaudreau or knowing that this post is about goals, would think this play ends in a goal? Not too many. He’s got one in pursuit and another D trying to cut off his route. It looks like the defenseman near the dot bought that Gaudreau was going to take him wide. Then he didn’t. If I didn’t know Gaudreau better, I’d be shocked he pulled it off, but that’s another example in a line of many that he is one of the game’s elite puck-handlers at any level. Not hyperbole. Here it is in GIF form again from Steph. Just… wow. He even hit the goal camera with the shot. 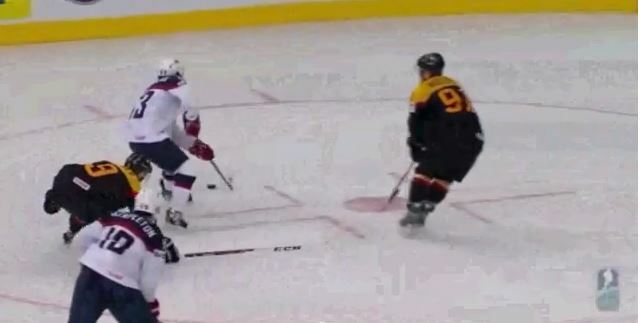 Gaudreau had four points against Germany with a goal and three assists including this ridiculous behind-the-net, turnaround pass to Justin Abdelkader to make it 1-0. This play is almost as pretty as the goal to me. How the hell does he do that? Seriously? That went between the D’s legs and right on Abdelkader’s tape. That’s just unfair, man. The Hobey Baker winner now leads Team USA with 10 points in the tournament including two goals and seven assists. This guy is a human highlight reel and despite being just 20 years old, he is putting on a show against grizzled European pros and NHL players. Could he be a full-time NHLer next year? I think he could be. Screw the size concern, he’s good. The World Championship may not be the cream of the crop, but this U.S. team has been fun to watch all tournament with the younger players doing some amazing things. You can downgrade the goals due to shoddy German defense if you want, but I don’t care what level this is at, those are world-class skill plays that just so happened to result in goals. That’s just good hockey right there. I’ll have a full recap of the preliminary round with thoughts on the players and brief hits on each game.